Lynher Barge is an original Tamar Barge built in 1896 by James Goss of Calstock. The barge’s life seemed to end in the 1950s, after an unexceptional career transporting cargoes of stone, coal and Plymouth dung to fertilise the upper Tamar Valley orchards when Lynher was abandoned to rot in the mud. No one gave her a further thought at the time, although a lovely sight to see sailing on the River Lynher and St.Germans, in her tanned sails and black hulls with white skirting board, it was common use to abandon these type of barges when they had served their times. Anyway, this was not going to be the fate of the Lynher Barge, which was built by a talented boatbuilder, unschooled and burly as many in his times and skilled as few in any time. James Goss had a different spark in his eyes, one that said “Not on my watch!”. He built boats for love and pride, he learned the hard way and sailed the seven seas before becoming a pillar of his community. He didn’t build boats to deteriorate in a few years’ time. Therefore 30 years on the Lynher Barge is still in the mud by Poldrissick Quarry, still with an intact hull underneath the water and original fittings on deck, included her shapely wrought-iron tabernacle winch used to lower her mast when passing under low stone bridges. In 1985 Charlie Force, decide that it was time for the old girl to resurrect and proceeded to dig her out by hand with a bunch of mates. a fortnight later she popped out of the mud like a beach ball and was subsequently towed to Morwellham Quay to be restored by the “bunch of friends” and the occasional boatbuilding expert to see to the planking. The barge was re-launched but unfortunately Charlie Force had to part with her directly due to a weak heart which failed him six months after he sold the barge to a nurse in the year 2000. The new owner enjoyed living on the boat until 2004 when the signs of rot became too evident and she was advised to bring her to a shipyard and to be assessed by a surveyor. 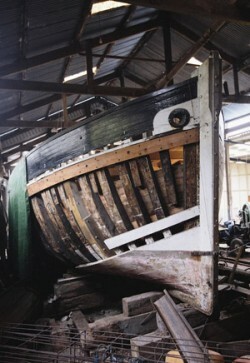 So she did, and in 2004 the Lynher alighted at Mashfords boatyard, where she still is. The extent of the rot meant a complete re-build of the structure, however the task turned up to be too ominous for a regular nurse’s finances. One day, in 2006, the money run out and the nurse had to walk away from the barge. The port side was re-planked and new oak knees where shaped and a new rudder and transom put in place by the shipwrights at Mashfords. Nothing else happened for 10 years. Recently the nurse decided to pass the ownership of the barge over to Dominic and Barbara Bridgman, who formed the Lynher River Barge CIC with the aim of fundraising for the complete restoration project. A business plan is in place for her future management and the operators have now receive funding to build a website with fundraising tools. Through the maintenance courses at Cremyl Keelboats people of all ages will be able to learn consistent boatbuilding skills on a live project of such dimensions and scale which no often comes about in this day and age.